This was one of my favorite cross-cultural confusions while in Denmark. One morning, while rushing to get out of the apartment for some not typical sightseeing in the Danish countryside, I asked my friend if we might have a little breakfast. What do you usually have for breakfast, I asked. He replied that he generally had a filling, but pretty boring breakfast cereal with milk. We went into the kitchen and poured the cereal into our bowls. It was called Havregryn. 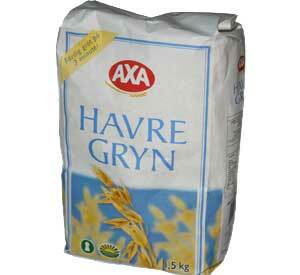 My friend didn’t really know the English name for Havre Gryn. Here I am, in the land of the Danes now, staying with my friend, the priest. He lives in the center of beautiful Copenhagen. Upon my arrival from Gatwick, 90 minutes from the land of mushy peas and crisps, I am greeted with a lunch, Danish style. It came with instructions. Thank God. An appropriate thought, when lunching with a man of the cloth. I recognized most of the ingredients of our repast. It was in the design of the eating, I found fascination. On that table was smoked salmon, some kind of sliced pork with swirls of parsley and pepper, dense dark bread, a sweeter type bread with golden raisins, cheese, tomatoes (that would be toe-MAH-toes), cucumbers, sliced sweet pickles and a bottle of Italian beer.